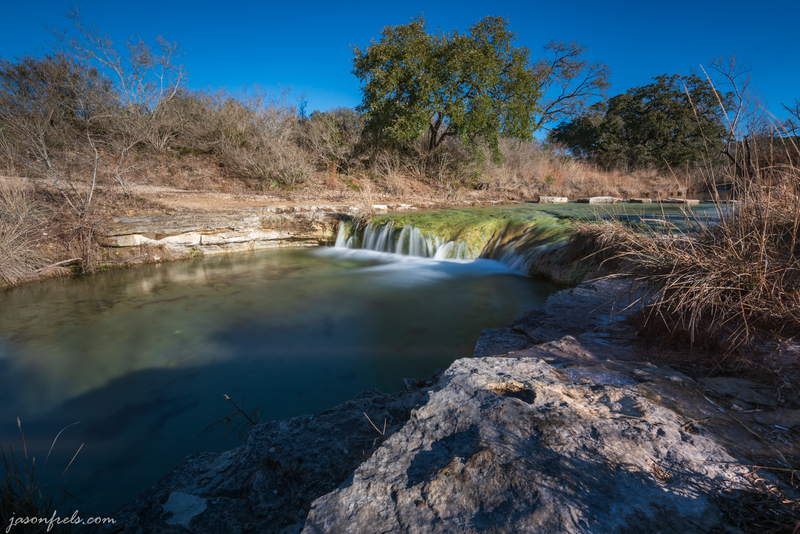 I live in Leander Texas (near Austin), and a near by place where I can go for a nice hike is Balcones Canyonlands National Wildlife Refuge. 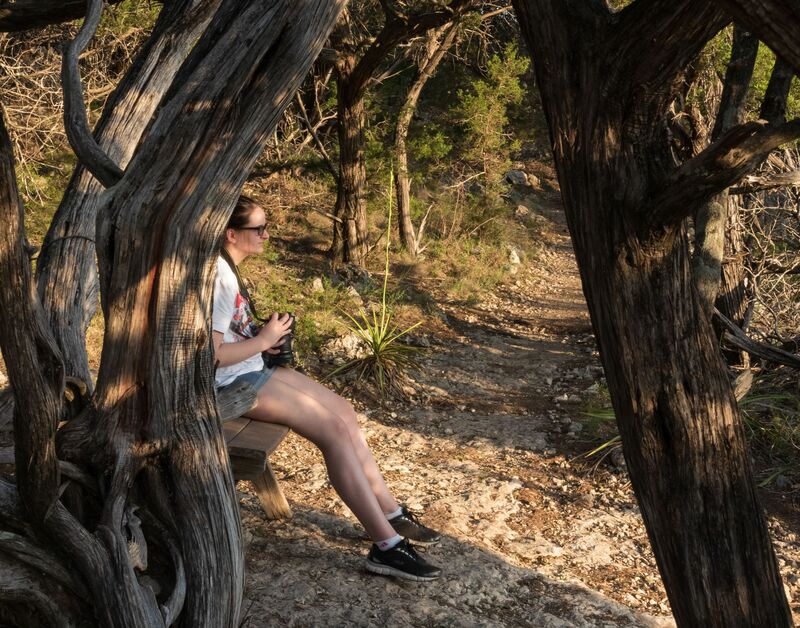 Balcones Canyonlands is located northwest of Austin and is open to the public for hiking and sight-seeing during the day. The intended purpose of the area is to preserve habitat for some endangered birds, but there are a several trails for hiking as well. 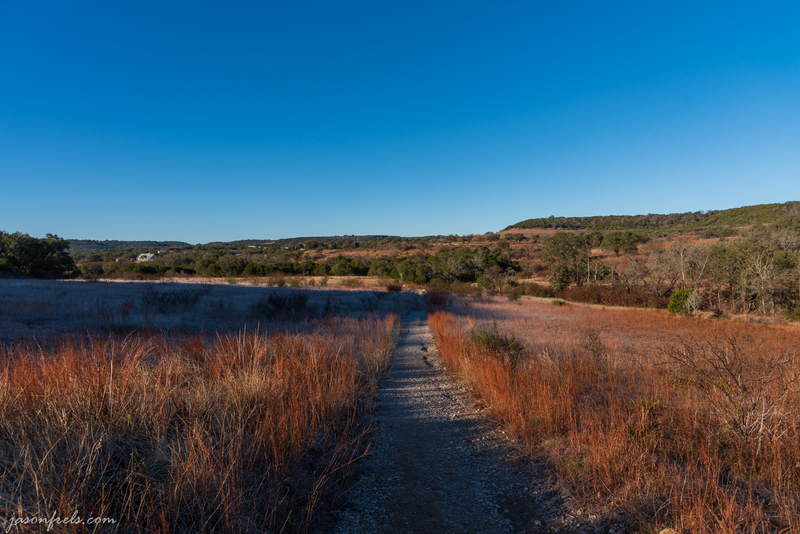 Just off the highway near Lago Vista is a drive to some hiking trails and a sunset deck. 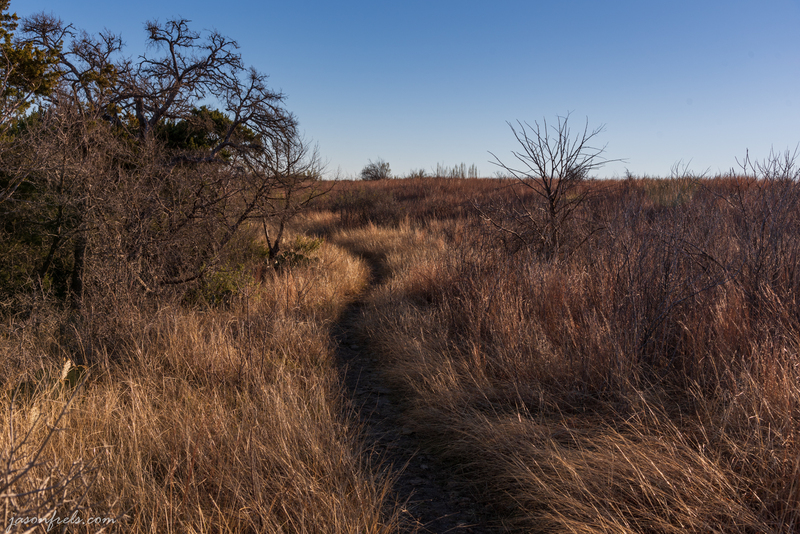 I have hiked the trails a couple of times, but don’t find them as enjoyable as the trails at the Doeskin Ranch area. 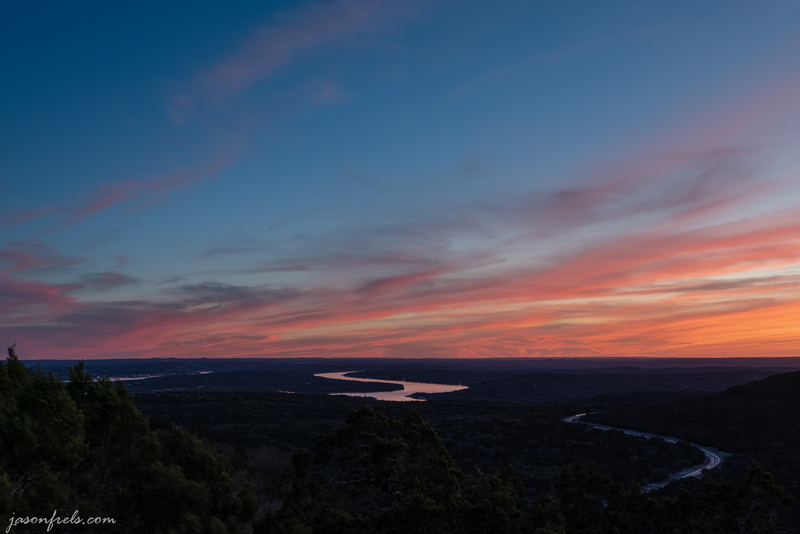 There is a nice sunset deck in this area that overlooks Lake Travis. You can see some fantastic sunsets here if you come on the right evening. 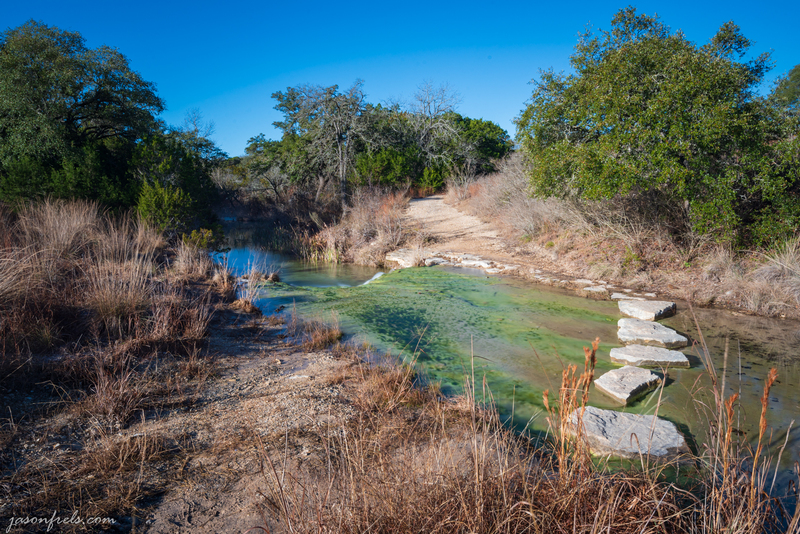 The address for the entrance to this area is 21646 ½ E FM 1431, Marble Falls TX 78654. 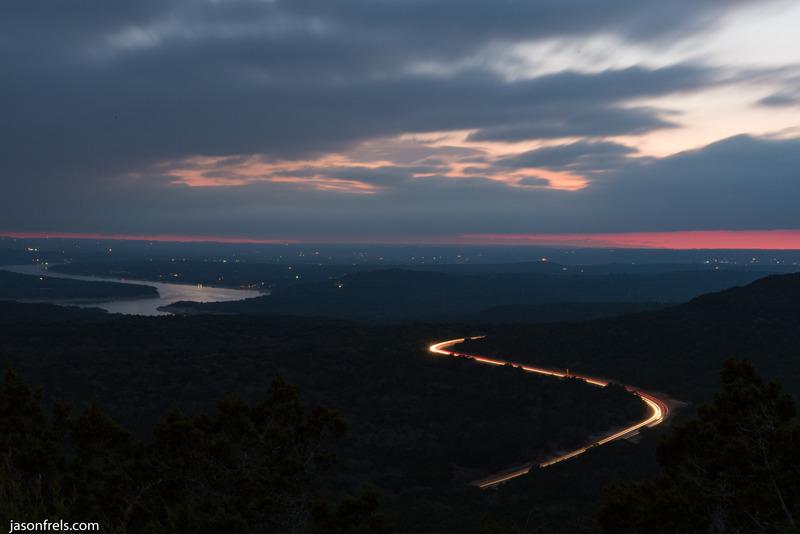 Below is a photo that I took at sunset from the overlook. It is usually not very crowded at sunset and you can drive and park right close to the overlook deck. There are usually a few people taking pictures, but few stay for the after-sunset glow as seen in the photo below. I stayed until it got a bit darker one evening and took some long exposures to get some care headlight and taillight trails on the highway near the lake. See the photo below. The hiking trails lead you to a few overlooks of the countryside and lake. 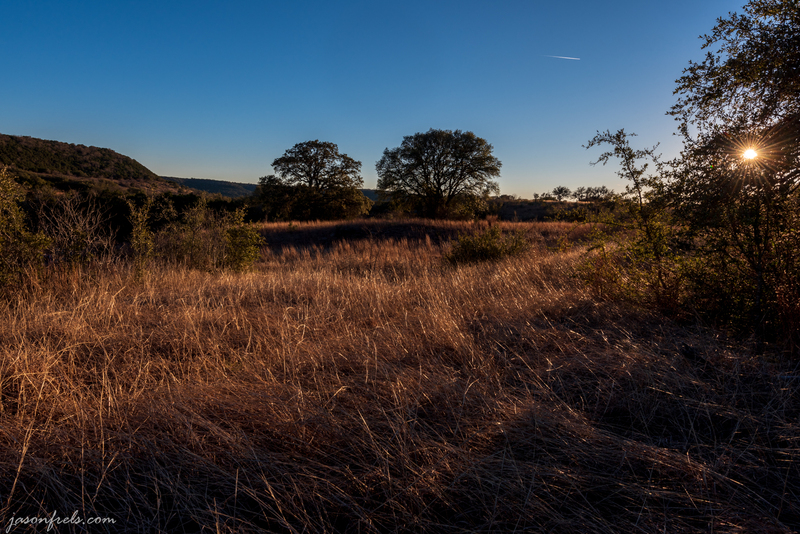 The Doeskin Ranch area is where the longer hiking trails are. I go to this area regularly to hike. There is a parking lot just off of FM1174. I have never seen it very crowded and it is a nice peaceful place to get away for a nice nature hike. The address to get to the Doeskin ranch area is 10645 FM 1174, Bertram, TX 78605. 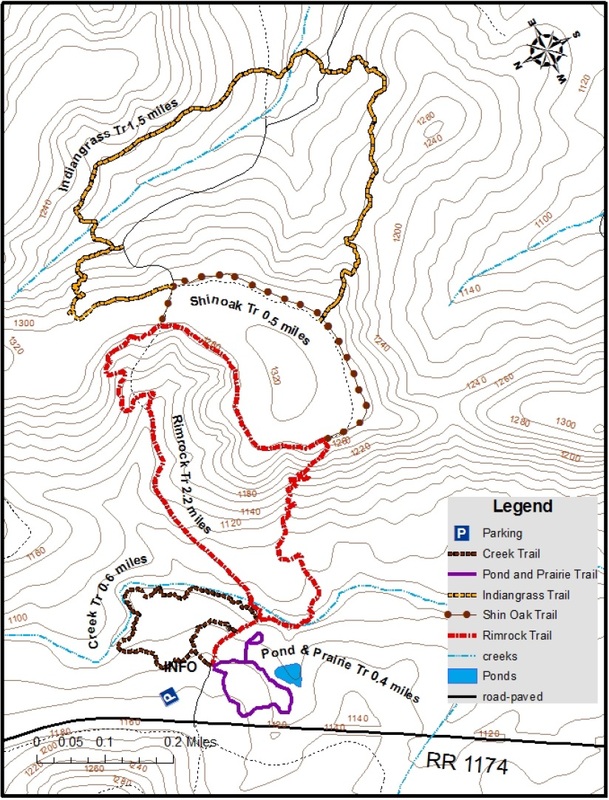 Below is a trail map of the Doeskin Ranch area. I usually take the Rimrock trail down from the parking area to where it crosses a stream with a small waterfall. Some people come to play and relax around this creek and waterfall and there are a few small trails that follow the creek. The first image below shows a long exposure (20s) of the waterfall with the stone step trail in the background. The next image shows the path across the creek. The Rimrock trail offers you two choices to climb the ridge to the other trails. They both switch back through the trees and offer a moderate climb. The following three pictures show views from this trail and my daughter on one of the benches on this trail overlooking the valley. Once you reach the top of the ridge on the Rimrock trail, there are a couple of other trails to explore in refuge. The Shinoak trail is a an easy walk over even terrain that takes you along the top of the ridge and to the Indiangrass trail if you like. There are several places to stop and look down the ridge along the trail. 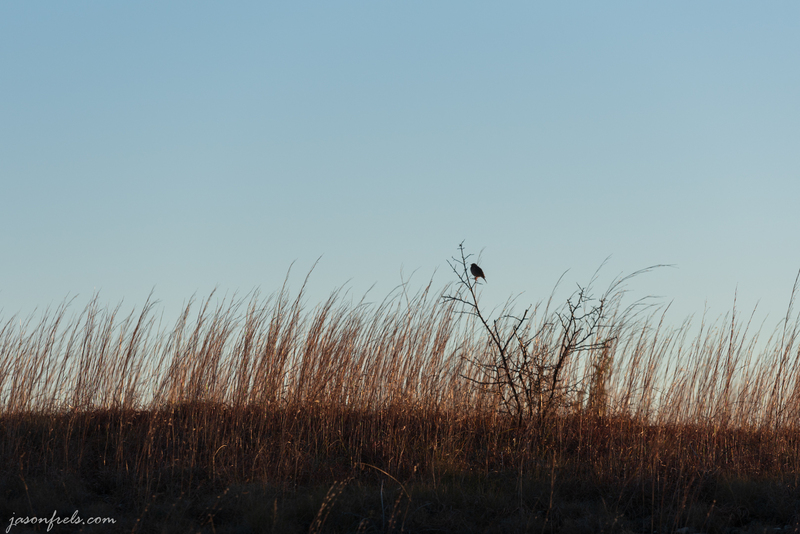 You may see a few birds along the trail in the tall grass. 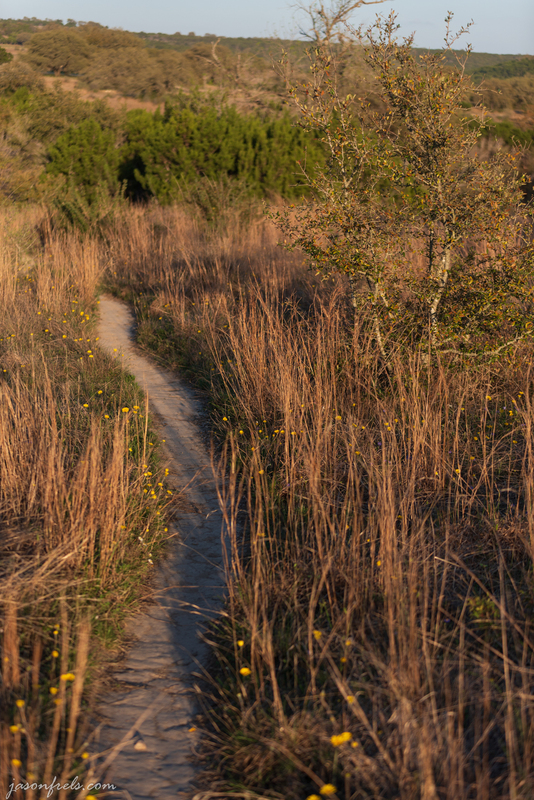 The Indiangrass trail takes you back into some additional hills amid the tall grass. It is my favorite part of the hike mainly because it is very peaceful and few people come back to this trail. The trail winds back and edges a small hill that is general blocked from hiking traffic. 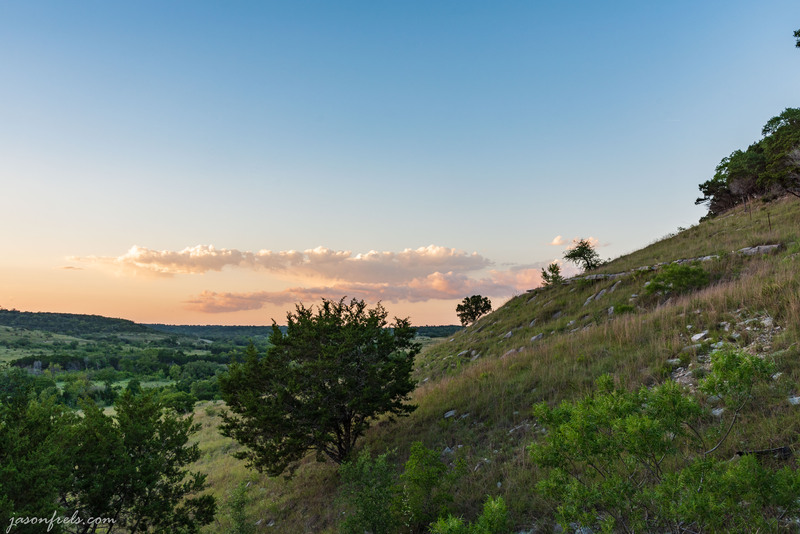 Below is a picture of the hill from along the trail and a panorama that was shot on the Indiangrass trail and includes the hill in the background. 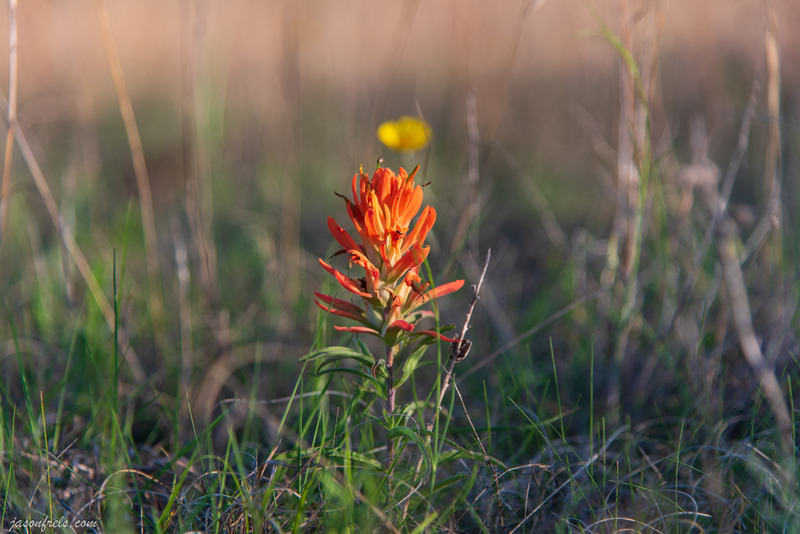 During the spring wildflower season, there are a lot of wildflowers blooming in the NWR. 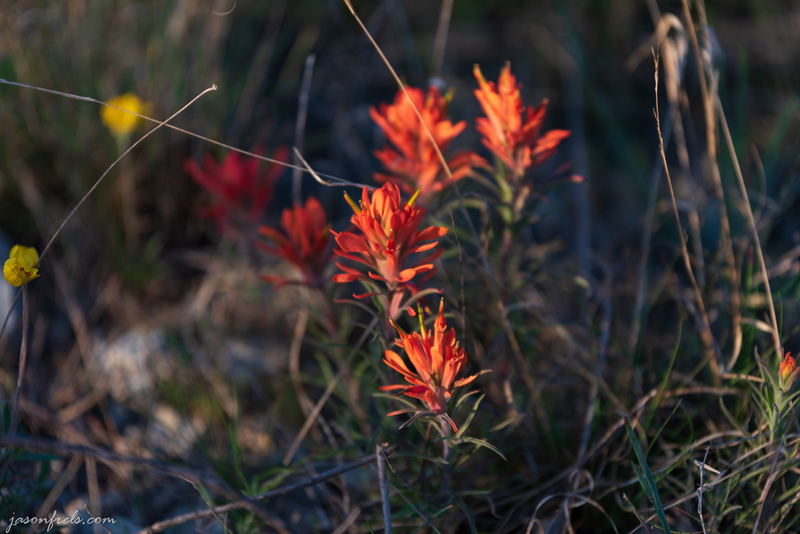 Notably the Indian Paintbrush and many others that I can’t identify. 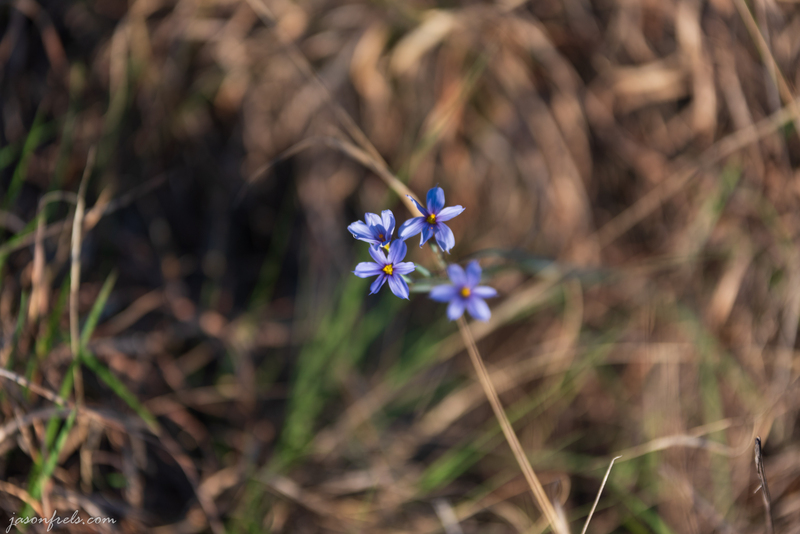 The photos below contain some wildflowers common along the hiking trails in early spring. 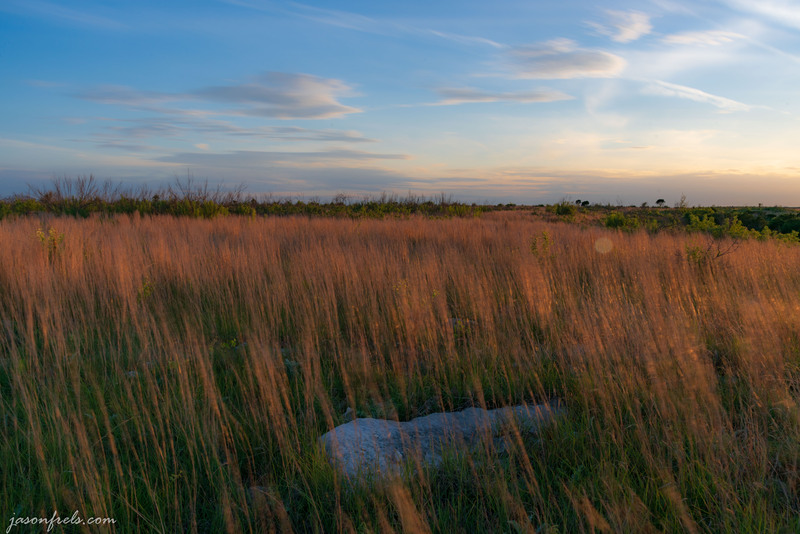 One of my favorite things in Balcones Canyonlands NWR is the long golden grass, especially how it looks during the golden hour before sunset. 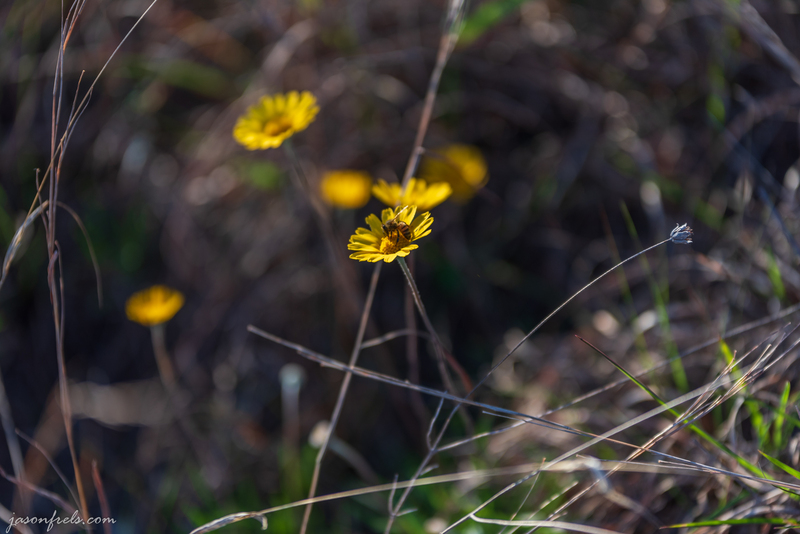 I have tried to capture the beautiful grasses in the photos below, but they are much more enjoyable in person. There is another observation deck on FM 1869 for bird watching. I have not spent much time at this observation point. 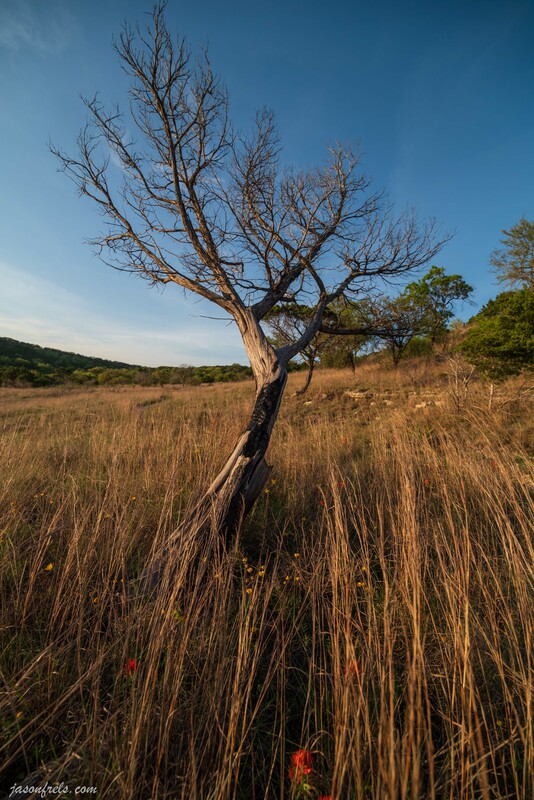 Balcones Canyonlands National Wildlife Refuge is one of my favorite nearby places to go and have a peaceful hike and enjoy the breeze. It is a bit hot in the summer, but I bring some water and enjoy it anyway. There is usually something interesting to see along the way. It really is a nice secret in the area that few people seem to know about. 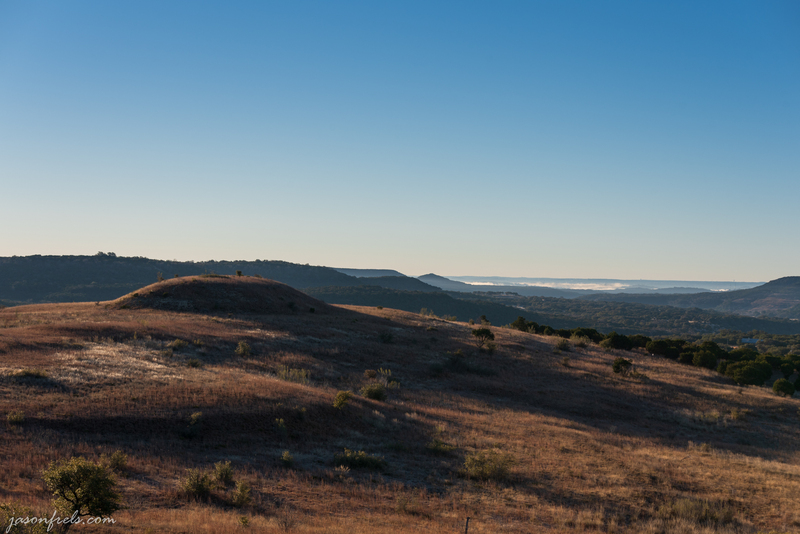 You can find blogs that I have written about Balcones Canyonlands NWR here. Perhaps I’ll see you out there.